Due to recent data and the chatter over it I felt a Market Update was needed before the next scheduled Update in August. In one of my Updates that I’ve received the most response from yet, ‘Market Update – Step Right Up, Buy a Ticket to America’s Rebirth Ride 4-11-2012’, I spoke about two major trends that I saw that I thought were rekindling a rebirth of American (US) economic strength: jobs returning to the US and the Shale Boom. Besides a link to a video of riding the Corkscrew roller coaster at Cedar Point amusement park, there was a map of the shale plays in the continental 48 states. Well if you read recent headlines about the unbelievable cut (96%) to the forecast for the amount of recoverable oil in one of those basins the Monterrey in CA you may be wondering if the Shale Boom is Busted. On May 22 there were no shortage of headlines and opinion pages calling into question the merit of the entirety of the US shale basins because of the Monterrey revisions excluding CNBC. While the EIA revision was shocking to say the least due to the difference (96% decrease) and such a revision form a reputable source, EIA, it doesn’t change the concept’s future to me. First, I never expected any really impact from the Monterrey basin before the revisions due to the political will in CA towards oil drilling in general let alone issuing drilling permits. 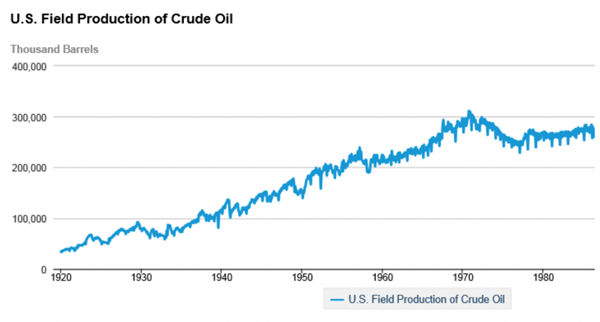 Second, Looking at the US EIA chart for monthly US Oil Production below (data is through March 2014) you can see that US oil production peaked in the first half of 1970 and then declined since May 1985. With the onset of the Shale Boom in the US domestic production has been steadily climbing since June 2010 – use this link to see the monthly data for this chart:http://www.eia.gov/dnav/pet/hist/LeafHandler.ashx?n=PET&s=WCRFPUS2&f=W. Data like the chart above and what we see from basins in the Bakken, Eagle Ford, Woodford and now Marcellus formations excite me about America’s oil and gas future. Per Greg Geuthner on June 5th in his ‘The Rude Awakening’ daily newsletter: “Right now, the market’s loving all things energy related. The oil services sector is leading the way in 2014, up more than 11.3% after posting more new highs yesterday afternoon. The energy sector isn’t far behind, boasting year-to-date gains of 8.4%. Meanwhile, the S&P 500 is up just 4.3% on the year.” To me the US energy boom/shale boom, is still a powerful trend that I believe offers many themes for long- term investment potential just as much as I have for the past several years. More specifically there exist opportunities for attractive income as well as capital appreciation along this theme beyond just stocks and bonds of energy companies. If you would like to learn more about what has become one of my favorite investment vehicles within my own portfolio please contact me for me more information. Speaking of income plays, after multiple years of gains on top of high yields, I have grown leery of high yield corporate bonds (“junk bonds”) in general. These are corporate bonds that are rated below investment grade or below ‘BBB’. According to Bloomberg, junk-bond investors are accepting payouts that are 0.74% lower than the earnings yield on the Standard & Poor’s 500 Index. Historically, debt rated below investment grade has yielded an average 4.2 percentage points more than stocks since March 1995. (Source: Bloomberg). This is concerning to me as it seems many investors are becoming too complacent about possible default risk in their quest for higher yields. Meanwhile the spread between Treasuries and though the spread between corporate high yield bonds and comparable maturity Treasuries is still decent but narrowing. Despite the current stable interest-rate environment and low default rates, I think a wiser course for high-yield investors is to consider taking gains, rotating to alternative income plays and/or hedging potential downside risk to corporate high yields. To learn more about how to hedge potential downside risk to corporate high- yield bonds or alternative income plays contact me for more information. In summary, while I still see lots of opportunity for potential gains in certain types of equities, especially the oil patch, I am leery of the downside risk of corporate high yield bonds and urge caution. Remember the ideas expressed in my Market Updates are simply my opinion. No one can accurately predict future events with consistency. My decision making is always first and foremost for your benefit; prudence and perspective govern my decision making. Remember that as your financial advisor I work for you. I invite you to contact me or any of The Gharib Group team at your convenience should you have any questions or need more information.